This volume offers a close analysis and textual study of Vico’s complex intellectual trajectory before the Scienze Nuove. 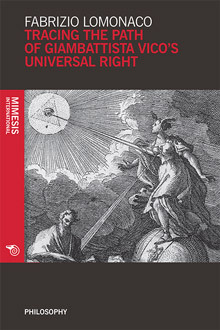 Particular attention is devoted to the three books of Diritto Universale, as they mark a significant step in the redefinition of the relationship between metaphysics and philosophical questions of law. In Vico, we witness the connection – rather than the juxtaposition – between natural and historic law, and a new notion of the natural right of people that theorises the historic right of nations. The modernity of Vico’s thought originates from his attempt to unify human and divine knowledge. As thoroughly discussed in this volume, Vico’s conception of the ‘verum’ aims precisely at combining history with those ‘human ideas’ that constitute a human history lived ethically in the experience of religion. Fabrizio Lomonaco is Full Professor of History of Philosophy at the University of Naples “Federico II”. He is Director of “Civiltà del Mediterraneo” and “Logos” (Naples) and has written more than 500 essays and articles devoted to juridical and philosophical culture in the 17th-18th centuries Dutch world (Grotius and Perizonius, Gronovius, Huber and Le Clerc, Noodt and Barbeyrac). He has also cultivated specific study interests on Southern Italian thought (Caloprese, Gravina and Vico, Metastasio and Spinelli, Genovesi and Pagano) and he has edited anastatic editions of writings of Vico, Gravina and Spinelli.